So you’re at an event and she walks in. There’s something about her that makes you stop and look. But it’s not just you; others are looking too. It’s not her chic outfit or even physical beauty, but something in how she carries herself. Intentionally or unintentionally, she commands attention. We don’t know her story, or maybe we do. But what she does in those next 30 seconds is very telling. I’m here. I’ve arrived. See me? Who do I know here? I’ll wait here for you to come over and talk to me. Whether from a place of confidence or insecurity, the Here-I-am woman is all about HER. See the emphasis above on the Me, I, and My. She’s really saying, “Please validate me, accept me, see me”. I missed out recently on reconnecting with an old friend. She was all glammed up at an event radiating a ‘Here-I-Am’ vibe. She had undeniable presence but appeared unapproachable and uninterested in connecting with anybody beyond her immediate circle. I wanted to say hi but was confused. In retrospect, I wish I had pushed, because I think it was a cover-up for her insecurity. I think her ‘Here-I-Am-all-fabulous-and-cool’ image was a power play for acceptance…only an acceptance that had nothing to do with actual friendship. She was hiding behind a very compelling persona. I understand the lure though of controlling how others perceive you. It seems safer than risking rejection. But it’s a dangerous cycle that rarely results in the comfort of being truly known and accepted by another. You miss out. You are worth walking over and sticking my hand out for. How can I make YOU comfortable? I’m excited to be with YOU. You are accepted, cool and fabulous, not me. She is remembered by the way she makes YOU feel. She may be outgoing…or she may have a quiet spirit, but you remember her. You like her because she first liked you. 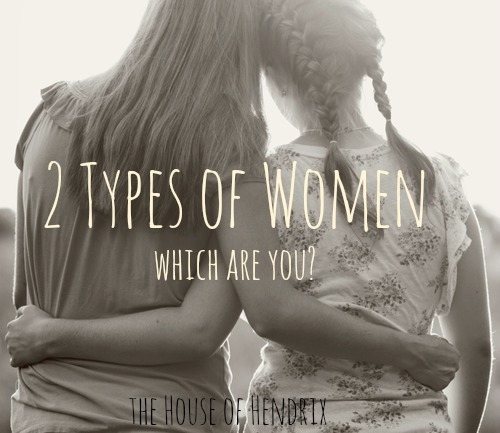 So what type of woman are you? Do you radiate ‘Here I am” or ‘There you are’? I think most of us have a natural inclination to ‘Here-I-am’ behavior, but not because we think we’re so fabulous. Conversely, we simply have a desire to be accepted and feel significant, and sometimes that can make us self-focused. What would happen if we treated everybody in our path today with a “There YOU are” attitude? Would the mom who feels left out at school events feel more comfortable? Would your spouse respond to you differently? Would that conflict with the neighbor change? Would you like yourself more? I’ve been watching my ‘There-You-Are’ friends and have compiled a list of the qualities I think sum her up. Do you know this woman? How does she make you feel? Life’s too short to withhold a compliment. Share this with her and say thank you. Give HER some encouragement. I’m grateful for you and would love to have you follow The House of Hendrix below and join our FACEBOOK COMMUNITY. You can find me on PINTEREST. This entry was posted in blog, Favorites, Motherhood and tagged character-building. Bookmark the permalink. I love this! I can vacillate between the two types in a crowd, but strive for the latter. This is a good reminder to be self-aware when around others. Thank you! thank you, thank you, thank you for this post. wow. it ministered and spoke to me so much. i’ve only been following you for a few months, (you’re the very first blog i’ve ever followed!) and i’ve truly enjoyed all of your writings. thank you for inspiring me to be the woman God wants me to be: a ‘there you are’ kind of woman. you are awesome! You’ve done it again with another great post! As a 19-year veteran Jazzercise instructor, it’s the “There YOU are!” personality that has the best rapport with customers. 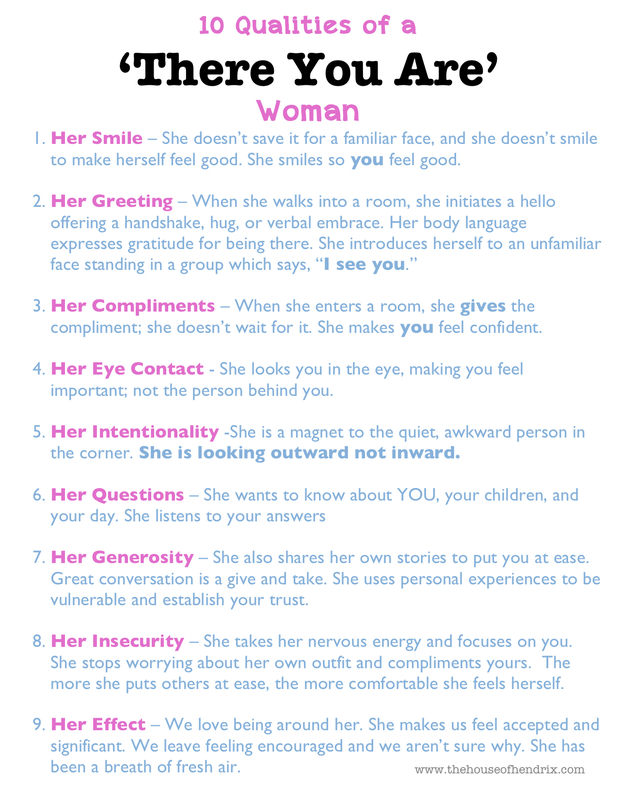 We’re all about helping other women feel confident and happy! Thank you for this! It couldn’t have come at a better time 🙂 An awesome reminder of the woman we are charged to be. I love this post Alli because you have always been a ‘There You Are’ woman. I often think of the way you asked about me and my weekend at work every Monday morning. You were always interested in others in a loving way and it showed in your face. You have so many qualities that I have often thought about over the years as I was faced with different situations. We didn’t spend a lot of time together but your spirit made a huge impact on me. I love reading your blog because it brings back to the front of my mind everything you convey and encourages me to think more deeply about myself and my actions as a wife, mother, friend, employee… Thank you!!!! Sweet Elizabeth! It has been over a decade but I just LOVE seeing your pictures on Facebook. I got excited with your engagement pictures and cute red shoes, your gorgeous (and FUN-looking) wedding, and the birth of your sweet baby. I oddly feel like I’ve been spying on your life. social media is strange like that. We’ve come a long way from Jerry’s office, but you too have remained in my mind. You were secure beyond your years and had a funky independence I always admired….comfortable in your skin. I am so glad to be reconnected. Happy, and a little nervous, you found this blog. It’s a bit of a vulnerable feeling to have it all out there but one I’m enjoying. Thank you for your sweet sweet words my friend. Jennifer, I am laughing out loud because everything I do is a little imperfect. I think I wrote 9 Qualities and thought I’d go back and add a 10th so there’d be an even #. Help me out, in your experience with There-You-Are friends, what is another quality they have? i was talking about this with my sweet friend on the day you posted this. i wanna be a “there you are” woman….praying Jesus helps me to get over myself more and more. This is so great!! I was at my dad’s party yesterday and I KNOW I was a little standoffish to some people that I didn’t feel comfortable with and was definitely preoccupied and the HERE I AM type. I’m going to remember this and REALLY work on it!!! I know for a fact that I stay away from certain people because they give off that vibe and here I am doing the same exact thing. This is an interesting post because I’ve never looked at it this way so thank you. I’m the here I am with no confidence, I suffer from social anxiety so I find situations like this difficult but would LOVE to be more of a There You Are person. My dad is a “There You Are” guy and I always wanted to be like him (I’m an introvert, and self-conscious). As I got older and more comfortable in my own skin, I realized I’m a “There You Are” person, too. It is one of the qualities that I like about myself, because it was something I had to practice and really work toward. I am totally a “here-I-am” lady. Not out of confidence, but insecurity. I’m excited to find your blog!!!! This is SO good. I have found myself feeling uncomfortable in many situations so am very conscious of trying to make others feel comfortable. I will be re-reading this again as I remind myself how important it is to make people feel valued. This post popped up in my email EXACTLY when I needed it! I had meant to comment months ago but got a little side tracked! I scrolled down to comment today b/c I think it’s important to tell you what a blessing this was for me. Julie, I just got goosebumps reading your comment.Wish you were in town so we could connect. I too have been the new person which can bring up all sorts of insecurities. Some of my favorite conversations have come unexpectedly when I was putting aside my insecurities to focus on others. Embrace your vulnerability. You sound precious! love love love love love this post. you are amazing,so insightful, so precious, so full of grace! I love love love you Jeannie. What incredible perspective! I am literally printing this off right now and putting it on my mirror! I long to be a “there YOU are” woman every. day.! But, if Im honest, it is only on the days i don’t live for others acceptance… but living from God’s grace, knowing He loves me everyday, all day, can’t even quit! (Can you tell I am just coming off a weekend with Jeannie Cunnion:) Thank you for making this practical Allison! I can’t wait to meet you. Pingback: The Unpolished Yogi | Silver Unpolished.